You have heard about the incredible, edible egg but have you heard of the incredible, investable Roth? Whether it was your brother-in-law bragging about his investment performance or your employer’s benefits meeting, Roths have probably come up once or twice in your life. Today we are going to take some time to review the Roth IRA and why I think it is an “incredible” planning tool from Millennials to Baby Boomers. Let’s start with the blueprint. After-tax dollars are invested. Simply put, you pay Uncle Sam today but never again. Tax-deferred, compounding growth, and tax free withdrawals. 2019 Updates: Single, income* must be less than $122,000 to be eligible. Married (filing Jointly), income must be less than $193,000 to be eligible. You can still save to a Roth if your income is above those levels, but it will begin being phased out (for example for a married couple at $203,000, you can no longer contribute to a Roth). If your income is higher than those levels, there are still ways to get money into a Roth IRA. *Income for a Roth IRA is your modified adjusted gross income (MAGI). Here is a full explanation of MAGI. Your Roth IRA offers unique flexibility in terms of access. With your Roth IRA, you will always have full access (tax & penalty free) to the amount you contributed. 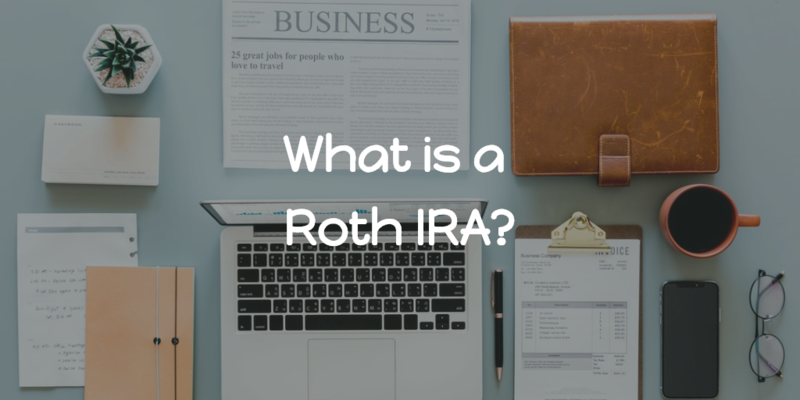 In order to pull any gains from your Roth IRA, you must make sure the withdrawal is qualified. The first rule is that you must have had the account for five years. Second, you must also meet one of the following requirements: over age 59.5, or death, or disability. Your Roth IRA will also allow access for a qualified first time home purchase and for college expenses. A non-qualified distribution may be subject to taxation of the earnings AND a 10% penalty. There are a few exceptions that do exist to avoid the 10% penalty, here is a list from the IRS. At the end of the day this is a retirement account, so even though it is “accessible” that doesn’t mean you should access it. Your Roth IRA is not for your dream vacation at 37 or your dream car at 42. Roth IRA for Gen X & Gen Y. Why should Gen X & Gen Y be using a Roth IRA? The main question you have to ask yourself is where do you think tax rates will be when you retire? Honestly, I have no darn clue where they will be, but our current debt level in the USA is at a microscopic $19 TRILLION. Taxes may not go up, but they surely are not going down in my opinion. Pay taxes today when you know what your tax rate is, take advantage of tax-deferred compounding growth for a few decades and then enjoy your money tax-free in retirement. Here is another one I hear often, “My friend told me a Roth doesn’t make sense because I will be in a lower tax bracket after retirement.” First, your friend doesn’t know your situation and most likely has no idea what he/she is referring to. Our parents and grandparents could retire off of their social security and pension incomes. Gen X & Gen Y may not have either one. This means you could be 100% responsible for your own retirement. Let me ask you this, when you retire do you want to live off of less income? Heck no! If you don’t have a pension and you don’t have social security, you will have to use your 401k/IRA assets. Guess what happens when you pull money from either? It is 100% taxable as income. If you were living off $75,000 prior to retirement and you want to maintain your lifestyle in retirement, you now have to pull $75,000 from your 401k/IRA (aka- you are still in the same tax bracket). This is also assuming taxes have not gone up. If taxes have gone up, the case for the Roth IRA is only more compelling. Roth IRA qualified withdrawals are not taxable, so if you pulled $75,000 from your Roth IRA it wouldn’t be taxable. Usually this requires a bit more strategy as opposed to my common recommendation for Gen X & Gen Y. However, I can usually make a solid case for most boomers and soon-to-be-retirees on having Roths. My typical boomer client has pension and social security income streams, and on top of that they also have built up a large portfolio of assets. Most of them can maintain their current lifestyle with just the pension and social security income. Every now and then they will call to pull some money for a trip or a unique occasion, but for the most part they’re not pulling money from their retirement accounts on a consistent basis. Then the government’s favorite age of 70.5 hits, and you are now required to take your required minimum distribution (RMD). If not, you will be taxed 50% on the RMD amount. Yes, you read that correct, 50%! So let’s assume you were living comfortably off of $84,000 per year ($7,000/m) in retirement and you now have $1,000,000 in IRA assets at age 70.5. Even though you don’t need any more income for this year because you are doing great based on your current income from social security and your pensions, the government will require you to pull the RMD this year. If we use $1,000,000 and the 2016 RMD table, you would be required to withdrawal $36,500 or pay a $18,250 penalty. That $36,500 is added to your income for 2016 and then taxed at your current income tax bracket. That is not a small amount of money and most likely will jump you up to the next tax bracket for income you DIDN’T even need. Fun fact: Your RMD withdrawal factor will increase every year! Roth IRAs don’t require an RMD, so the above scenario can be eliminated or at least limited. For most boomers, they have had a few decades of a head start on 401k/IRA savings so it would be difficult to get to an equal split between 401k/IRA vs. Roth assets. However, it is a good idea to start saving to a Roth IRA or even a Roth 401k heading into retirement to try to contain the RMD nightmare noted above. There are other strategies that can be utilized to convert large portions of 401k/IRA assets to your Roth IRA but there are numerous factors to consider and too detailed for this blog post. One last important point for boomers, a Roth IRA can help you lower or possibly avoid the current Medicare surtax. This is one benefit that is usually missed when discussing Roth IRAs for boomers. Roth IRA withdrawals won’t count towards your MAGI (modified adjusted gross income), although withdrawals from your 401k/IRA will count towards your MAGI. Estate Planning with a Roth. A Roth IRA can also be a wonderful estate planning tool. I won’t dig too deep on this idea, but I will leave you with some food for thought. There are no required minimum distributions (RMDs) forcing you to pull money out, taxes were already paid in advance, tax-deferred and compounding growth, and Roth IRA assets avoid probate as long as you have designated beneficiaries. When you combine those items, you get a pretty solid estate planning tool. For our visual learners, here is a great chart from Fidelity. 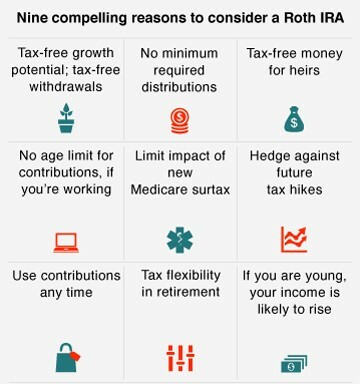 Moral of the story is the incredible, investable Roth should be in your planning and retirement strategy whether you’re a Millennial, Gen X’er or Baby Boomer. Converting from a traditional IRA to a Roth IRA is a taxable event. A Roth IRA offers tax-free withdrawals on taxable contributions. To qualify for the tax-free and penalty-free withdrawal or earnings, a Roth IRA must be in place for at least five tax years, and the distribution must take place after age 59 ½ or due to death, disability, or a first time home purchase (up to a $10,000 lifetime maximum). Depending on state law, Roth IRA distributions may be subject to state taxes.